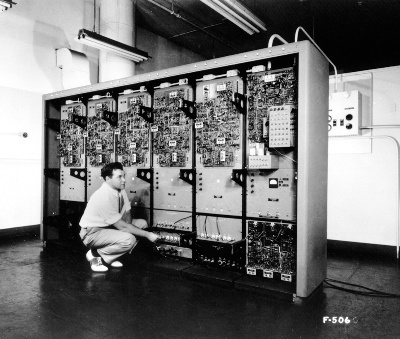 On June 24th, 1953, in an undisclosed location somewhere in the western United States, a small group of computer engineers, headed by one Adrian Luthwaite under the supervision of the Department of Defense, put the finishing touches on the most sophisticated computer of the era: the Massive EPICAC Relay, or M.E.R. The machine was the brain of a large network of hidden missile units, as well as some of the very first (unofficially) unmanned aircraft, to be used in the case of a Communist attack upon U.S. soil. M.E.R. was able to assess threats automatically, using pre-programmed parameters, allowing for a response dependent on a much smaller group of human operators than was required at that time, allowing for a faster response while theoretically decreasing mistakes due to “human error”. Operators nicknamed it “The Theremin” for the sounds it made as it crunched data. Unfortunately, humans were still required to program M.E.R. and in the fall of 1954 tragedy struck, when the computer fired upon an elementary school, killing 150 people, mostly children. An investigation would find that M.E.R. had assessed a P.E. class as a small, expeditionary force and sent out 3 armed drones to the site. The event was quickly covered up and the families compensated. M.E.R. was, understandably, deemed too much of a liability and was quickly and quietly dismantled and put into storage. Strangely, the DoD decided to the machine at a local self-storage facility. The reasons for this are unclear, but it is theorized that this site was chosen by David Forsythe, whose brother, Lawrence Forsythe owned the self-storage unit and who was said, at the time, to be “a little tight on cash.” Whatever the case, what is known is that Forsythe declared bankruptcy in 1964 and ownership of the land and everything on it fell to Wells Fargo. What follows is a long series of sales to other financial institutions until March 1998 when the current owner of the deed, New Mexico Bank & Trust, held an estate auction for the land and its contents. It was finally sold to ChC Information Systems for a sum of $250,000.00. ChC knew exactly what they were buying. How, I am not sure, but it is clear that not long after taking control of the land, the company began to reassemble M.E.R. Scores of Russian laborers were brought in to work on the project. Internal memos I have found while rummaging through Zo’s office show that nearly a third of these workers perished during reconstruction. The majority of these deaths were surprisingly not during the construction of the Catacombs, but during the early test phases and most of these were due to the computer’s propensity for using the pneumatic messaging system in the Catacombs as a weapon. It seems that the engineers could not reprogram it completely and it was using the tubes in lieu of the original, explosive ordinance it was used to. Nevertheless, on or around March 2005, M.E.R. was considered fully operational. It would control climate, communications, and security for the entire warren as well as oversee the print facilities. HAPPY BIRTHDAY , MER! I squish you to bits this weekend! It would only take half a pillowcase full of grenades to kill everyone on earth who even comes close to being cooler than you. That was epic in so many ways. Can’t wait to see you and a certain cavy this weekend! Knowing you have an array of powerful weaponry at your immediate disposal only makes ya even more awesome. NZ won’t know what hit it. Well, Happy Birthday then, to my MOST favorite digital, homicidal entity. Thanks for this, Ross, you big, beautiful weirdo. Your long-coveted Panda bone papasan chair (and Megalodon skin couch) are in the mail. Late, I know. But nappy nerfday! Oh, damn I’m late also! Happy Belated Birthday, Mer! I hope it was a marvelous time for you.